George Gordon 6th Baron Byron. autograph Signature. British poet. Author of Don Juan, Childe Harold's Pilgrimage, etc. 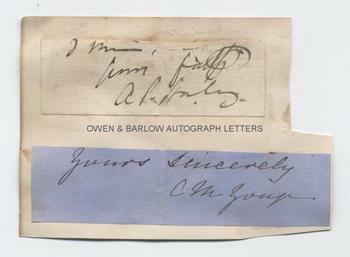 Autograph Signature and subscription "yours sincerely", clipped from foot of a letter. Paper piece measuring approx 2 x 1.25 inches, laid down on part of an album leaf (with clipped signatures to the verso of novelist Charlotte M. Yonge (1823-1901) and the cleric Arthur Penrhyn Stanley (1815-1881). The clipping of the piece just shaves the flourish of the signature and the 'y' of 'yours' by a trifle, but otherwise a nice example of this scarce signature. Lord Byron is generally regarded as one of the greatest poets in the English language. His adventurous and sometimes scandalous life, his relationship with Shelley and Mary Shelley, Lady Caroline Lamb's observation that Byron was "mad, bad and dangerous to know" and his tragic death have all added to his reputation as one of the great figures of history and literature. 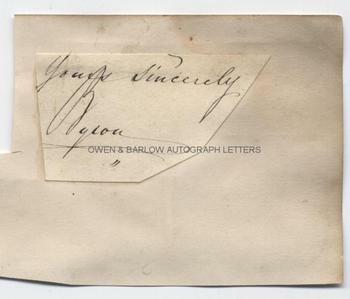 His early death at the age of only 36 makes his autograph uncommon. From a 19th century album compiled by the Marryat family, relatives of the novelist Captain Frederick Marryat, author of Mr Midshipman Easy, Children of the New Forest, etc.